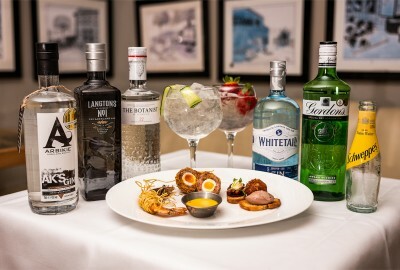 If you are a gin lover, come and spend a relaxed evening discovering some of the finest gins around whilst enjoying a selection of canapés crafted by our Head Chef. Our gin mixologist will guide you through an innovative gin & tonic tour featuring our four small-batch gins and our reference gin, Gordon’s (5 x 25ml servings) over the course of an hour and a half. Each gin will be served with the newly-launched Schweppes 1783 Premium tonic water range – both classic & flavoured. To finish your luxury gin tasting experience, you will be able to choose your favourite gin to enjoy as a long drink with various garnishes (50ml serving). Our gins will also served alongside a selection of finely-crafted canapés. Our gin tastings begin on the 8th March and run from 19:30 - 21:00 every other Friday. We also invite you to dine on our £29.50 three course set menu after your gin tasting experience. This experience is valid from Friday 8th March on every other Friday from 7:30-9pm in London Steakhouse Co - Chelsea.